What seems to be the most anticipated comic book of 2014 (at least at the moment) has come to its audience. And apparently everyone of this audience and their mother and dogs seems to like it. 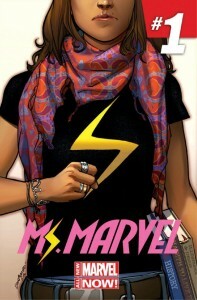 Kamala is a geek/nerd. She likes the smell of bacon, writes fanfiction of Marvel superheros and is an outsider at ther school because of her religion/ethnic background. Her schoolmates use her and her friend’s religious beliefs to ridicule them. Kamala’s brother is a very devoted muslim, praying all the time. He is ridiculed for this by his own family. Her father is the family’s patriarch. Possible love interest in the not-muslim and not-Pakistani figure of Bruno. Come on. Isn’t this just a bit too much?